Robust welded steel tube and angle construction. 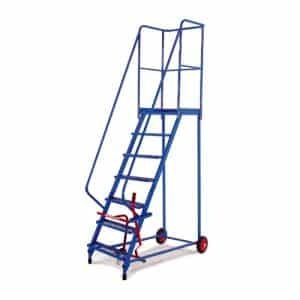 Suitable for all types of stockroom work where strength and stability are required. Rubber tyred wheels and nylon swivel castors for increased durability. Warning bar operated through a lever restricts access until steps are grounded. Large working platform 540mm (w) x 460mm (d). Manufactured to European GS Standard. Wide range of sizes and specifications available – please call for details. Fully welded mobile safety steps. Rubber tyred wheels and nylon swivel castors. Platform size: 540mm W x 460mm D.
Expanded steel steps and platform. Safety bar deters access when steps are mobile. Fixed aluminium single sided machine steps. Complete with hand rail (supplied loose for fitting either side). Chequer plate platform size: 420mm x 380mm. Max 150kg work load capacity. Deep serrated non slip aluminium tread plates. Extra large top platform for increased stability. Conforms to EN131 and European safety legislation for industrial use. Strong deep treads for comfort and security. Steel kick stools ideal for offices and stockrooms. Non slip rubber mat on top. Access hard to reach places with ease and low risk of injury. Available in high visibility colours. Twin castors that retract when steps not in use. 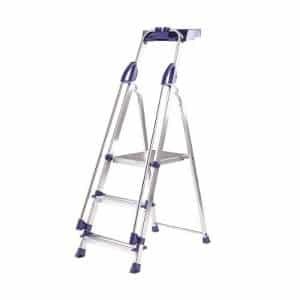 Our range of steps and ladders will make a greatly useful accessory to your shelving system, whatever that may be. 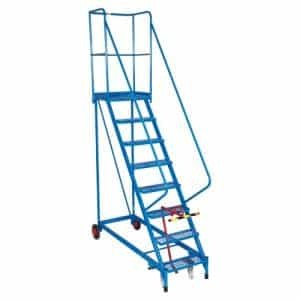 Check out our wide product range and you’ll find a great variety of industrial steps and ladders that will allow for a safer and better accuracy in picking and replenishment, both in warehouses and stockrooms.